Click here when done viewing or press your keyboard <backspace> key. Our welcoming sign on Esperanza Boulevard. 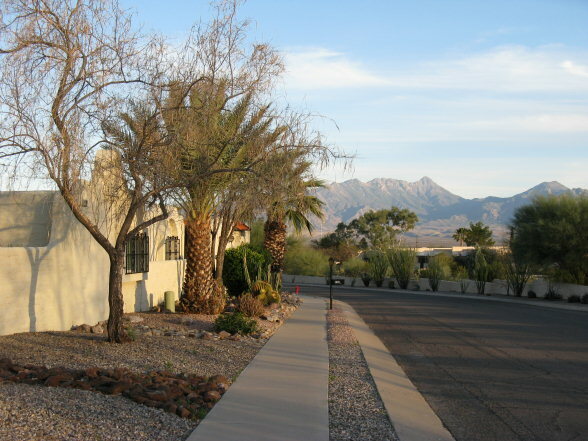 The streets of Esperanza Estates. 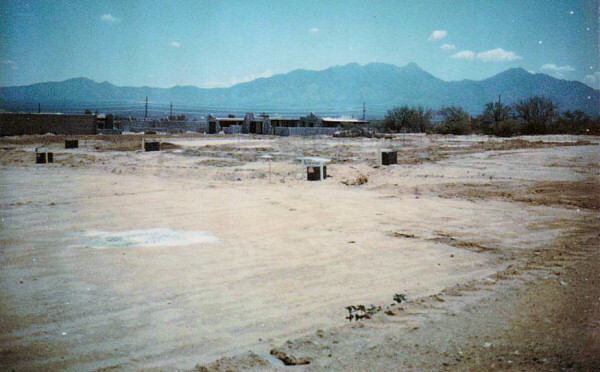 View from the approximate location of 758 Ensalmo, looking toward the Southeast, taken during the earliest phases of construction of Esperanza Estates. Current view from the roof of 758 Ensalmo, also looking toward the Southeast. the earliest phases of construction of Esperanza Estates. 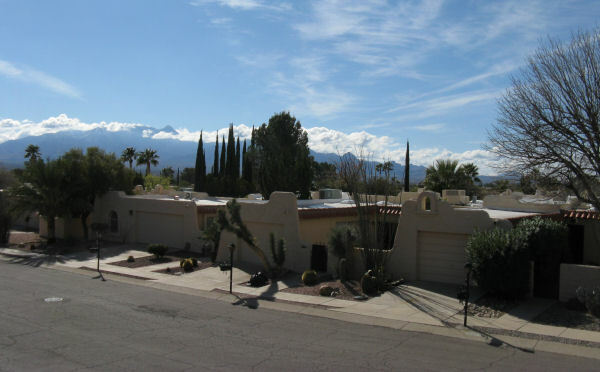 View of 759 Ensalmo as it appears today. Previous 'makeovers' of common area near pool. Construction of the new Ramada. A walking view with Mts. Wrightson [L] & Hopkins [R] in the distance. 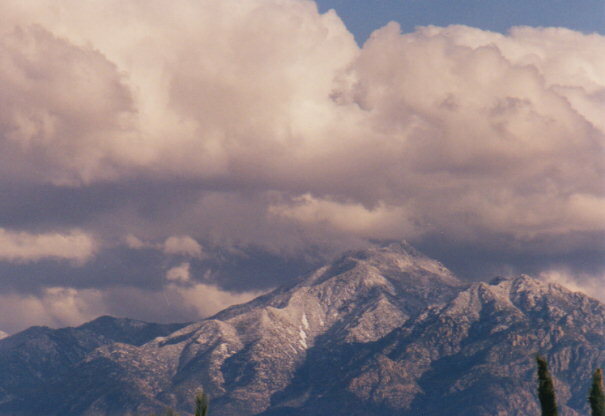 Mount Hopkins shrouded in low clouds. 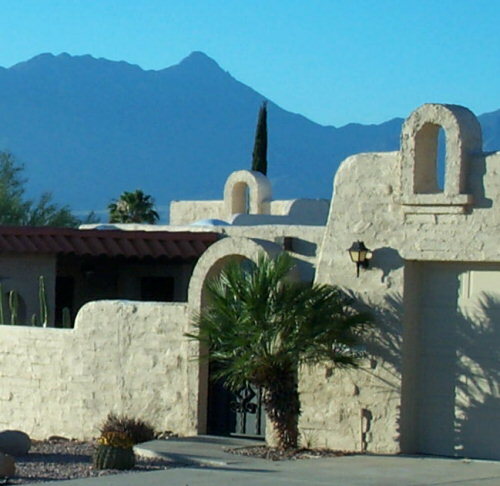 Sunset Ramada continues the use of red tile and concrete wash over adobe block seen elsewhere throughout Esperanza Estates. 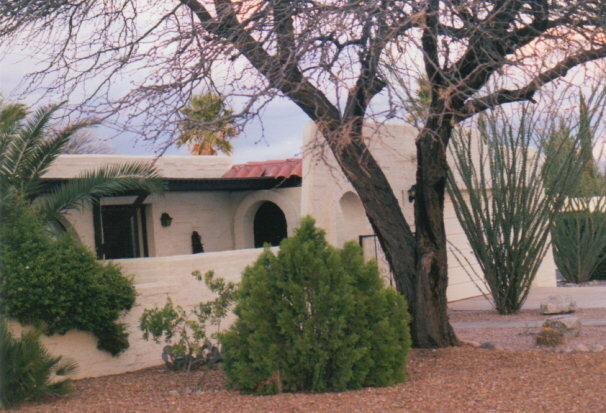 Arches are an architectural detail seen throughout Esperanza Estates. 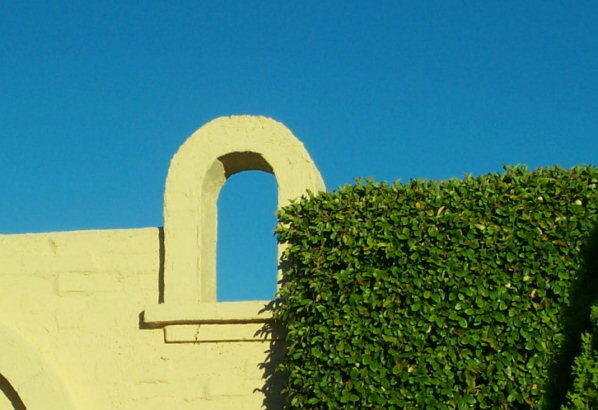 An arched window and meandering adobe wall. 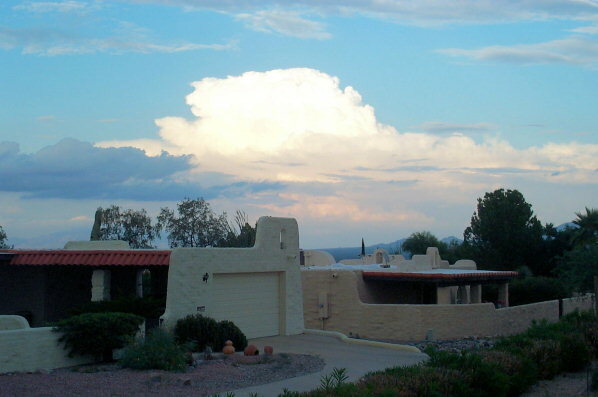 Some architectural & landscape forms combined with a Monsoon cloudy sky. Arches in arches, with the gate in the foreground echoing the curvature of one in the background. Walls of varying heights create front and back courtyards of many different shapes and sizes. Early morning interplay of colors, textures, shapes, distance and shadows. 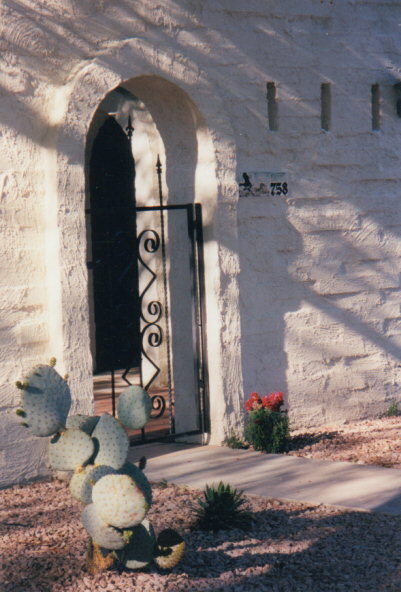 Two 'natives', a Mesquite tree and Ocotillo, border the walk to the arched gate. 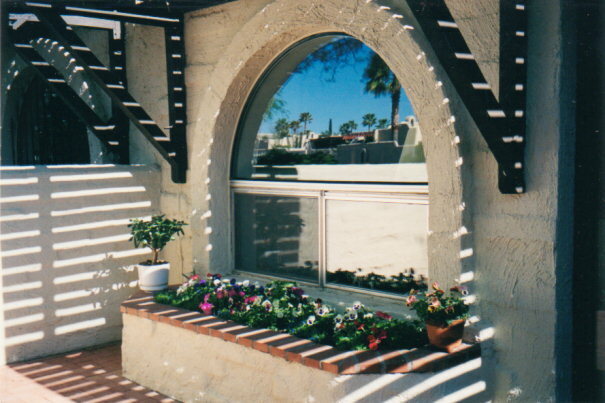 Palms & arches reflected in an arched window; a planter with annuals below. Prickly Pear Cactus (Opuntia, or Paddle Cactus) in the foreground is a common culinary species. 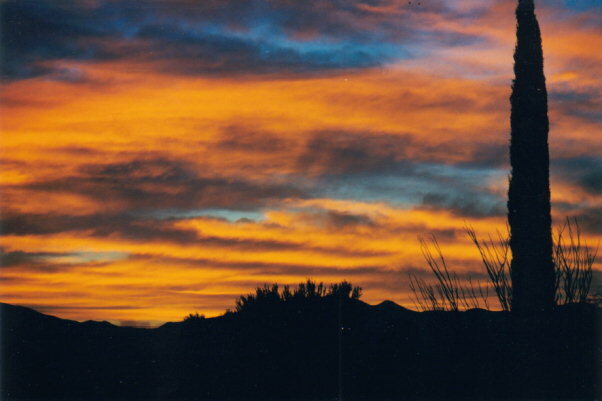 Green Valley's 'big sky' shows endless combinations of sky, sun, and clouds. 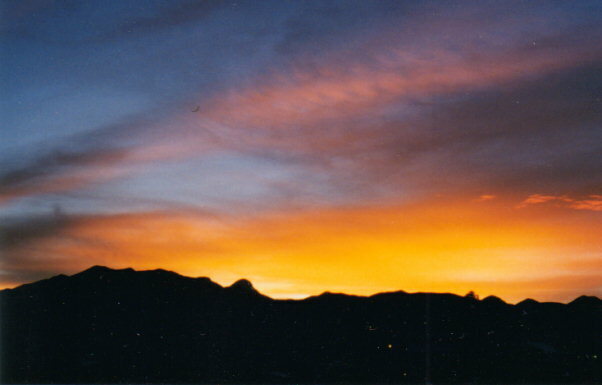 ...with every minute of each sunset being a little bit different.